The Cobra Microfiber Glove is an absolutely amazing product. No soap. No chemical cleaners. Wet or dry, this non-abrasive material cleans like magic! 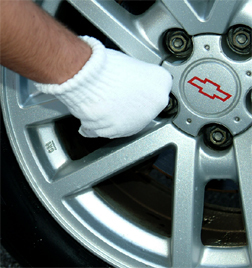 Use it dry, and the Microfiber Glove is like a dust magnet. The thousands of superfine fibers reach into nooks and crannies and quickly lift the dust from your dash, console, instrument panel. Add water, (soapy or not) and use the Microfiber Glove to reach small areas. Your wheels will look as good as they did on the showroom floor! And it shines chrome to perfection! Microfiber is a soft, non-abrasive material. You can be confident when polishing chrome or washing your delicate clear coated wheels. These gloves will become a bike owner's best friend. When gloves becomes dirty, simply machine wash with a mild detergent in cold water. Always wash all microfiber products separate from cotton towels or other laundry. Lint and fibers will be captured in the microfiber strands. Do not use bleach or fabric softeners. Tumble dry or allow to air dry. There is no right or left and one size fits all. Package contains 2 universal fitting gloves. Made in Korea.